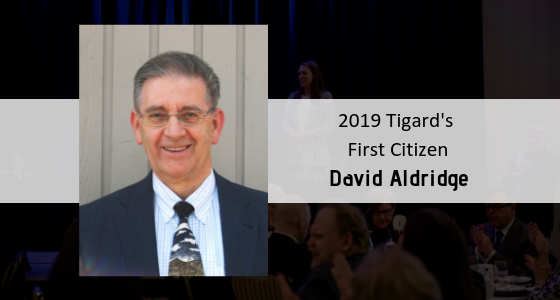 David Aldridge has been named as the 2019 recipient of the Tigard’s First Citizen award. This award recognizes someone who has made in-depth, long-term volunteer contributions to the Tigard community over the years. The winner is active, involved, interested and enthusiastic about making Tigard a nice place to live and work. This individual excels in any area of unpaid endeavor of education, social services, youth work, and community improvement of public services. This award is given in the spirit of all volunteers who remain unknown. The recipient joins the ranks of those previously honored in continually striving to improve the Tigard Area. David Aldridge’s contributions to the Tigard community have covered a wide range of activities and organizations including the Good Neighbor Center, Tigard CERT, St. Anthony Severe Weather Shelter, the American Red Cross, Coffee Creek Women’s Correctional Facility, the Pumper Car, church, and general community service. All of these areas of volunteerism have a common theme of helping those in greatest need. He has selflessly given thousands of hours of service across our community. This includes 20 years as a weekly overnight host at the Good Neighbor Center Family Homeless Shelter in Tigard, sleeping on a couch 1 night each week to ensure the safety and security of Good Neighbor Center families, and enabling the agency to run cost effectively. In addition to his service in this aspect, David is currently serving and has been on the Board of Directors for the Good Neighbor Center for the last 6 years. Keeping his focus on the community of Tigard, David has been a member of the Tigard Community Emergency Response Team (CERT) for over 10 years, helping his community and neighbors be better prepared in the event of a serious natural or other local disaster. CERT is entirely volunteer run and is a program of the City of Tigard. David also serves as a volunteer staffer for Saint Anthony’s “severe weather shelter” for the homeless, often helping to stay overnight (and more) as a volunteer host. Though not a member of the Catholic Church himself, he believes in what St. Anthony’s is doing and has given countless hours over last 5 years in support of their work on many occasions. Continuing in his spirit of giving and service, David is also personally a member of the “Ten+ Gallons Given Club” with the Red Cross where he’s donated over 12 gallons of blood/platelets. This equates to over 96 pints of blood! Although this next service takes place in our neighboring community of Tualatin, Oregon, David for many years has served at the Coffee Creek Women’s Correctional Facility on a weekly basis, overseeing an addiction recovery in-service program for the female inmates. Coffee Creek is the only Women’s Correctional facility in the state so it services all communities. This is an unpaid community service position requiring him to be at the prison three times each week. He has been providing this service for several years now and is the only volunteer that shows up rain or shine, even in the snow, week-in-and-week-out and on holidays. David also gives a great deal of church and general community service through JustServe.org and more, visiting the elderly in the area, assisting with addiction recovery programs and meetings, emergency preparedness, community education, and more. He has a greeter and supporter at the City of Tigard Community Preparedness Fair since the beginning. David helped raise a significant amount of funding to support a local Tigard company, Columbia Inland, manufacturer of The Pumper Car, an FDA approved medical physical therapy device enabling patients of all ages, but especially special needs children, who suffer from autism, down syndrome, cerebral palsy, and many other maladies, to be able to exercise and improve their coordination and conditioning in some extraordinary ways. Last but not least, David was awarded the Tigard Shining Stars “From the Heart” Volunteer of the Year award in 2013. As you can see David has engaged at a broad level across the Tigard community on behalf of the community. It is obvious he cares deeply about the place that he lives and its vulnerable community members. In all his roles he is always selflessly looking out for the betterment of the community at large. Please join us in congratulating David on his award and thanking him for his service to our Tigard community. His award will be formally presented with other Tigard volunteer and business awards at Tigard’s 2019 Shining Stars Community Awards Gala being held on Friday, May 3rd, from 5:30-9 p.m. at Embassy Suites – Washington Square, our event location host. With a theme of travel, this elegant themed event includes a silent auction, dinner, dessert dash, awards and more. Tickets are $60 per person. Get ready to travel the world and join us to celebrate Tigard! 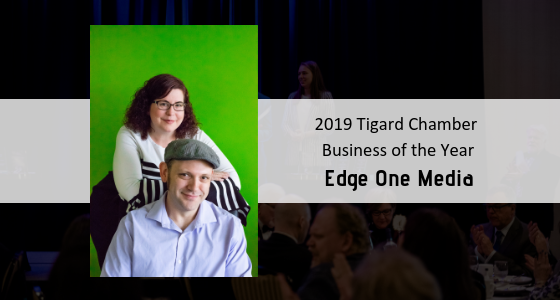 Edge One Media, Owned by Nicholas De Salvo and Megan De Salvo, partners in business and in life, has been selected as the 2019 Tigard Chamber Business of the Year. This award recognizes a chamber business that has made in-depth contributions to the Tigard community through their business. The winner is active, involved, interested, and enthusiastic about continuing to make Tigard a destination of choice for local business. Nominee must be a chamber member in good standing. You can see this rings true about this company and this couple based on their level of community impact. Key Volunteers with Tigard Tualatin Relay for Life over the last 8 years. Megan has participated in Tigard/Tualatin Relay for Life for the last 8 years and Nicholas for the last 6 years. Seven of those years, Megan was the Co-Chair for the event. Under her tenure, the event grew from a handful of Committee Members, 14 Teams and $28,000 Raised to 17 Committee Members, 33 Teams and just under $100,000 raised. Nationwide, the American Cancer Society (ACS) has seen a decrease in participation in these events, while the Tigard/Tualatin Relay for Life continues to see growth adding Sherwood to their event this year. Due to the teaming of Megan and Nicholas and Committee Member Angie Linderman (also a Chamber Member), the Tigard Tualatin Relay for Life was recognized last year with a National Award for Best Marketing out of all RFL Events. Because of these accomplishments Megan has been asked to be a member of the ACS Area Team Leadership. Nicholas has also given his time to the American Cancer Society’s Tigard / Tualatin Relay for Life as the Luminaria Ceremony Chair and has the large task of compiling images into a video for their Luminaria Ceremony held at dusk each year during the event. He has spent hundreds of hours designing these videos and each year it gets more difficult to see friends and family and others loved ones go from the Survivor section to In Memory. His Luminaria Ceremonies have gotten a lot of attention including TV press for the event, people share their experience from our ceremony with others, and for many it is how they first get introduced to the event. He has already had press for this year’s event in July. Due to his involvement and passion he was asked to be a key volunteer with ACS as part of the Area Team Leadership and helped lead the “How to tell your ACS Story” session at this year’s Relay for Life Summit in Salem, Oregon. Early supporter of Downtown Tigard events (Street Fair, Tree Lighting, Trick or Treat Main Street) through Graphic Design and Marketing Collateral. Non-Profit Great Website Giveaway as part of Edge One Media’s 15 Year Anniversary Celebration. This benefited Tigard Chamber member Project Homeless Connect who delivers needed support services to our homeless friends in both Tigard and throughout Washington County. Their new website is highly navigable, feature rich and helps tell their story. Reduced rates to other non-profit raffle participants in the Non-Profit Website Giveaway for website updates / creation- This has directly benefited the Tigard Downtown Alliance who is about ready to launch its new website. Free Design Services / Social Media and Pay Per Click Ad Assistance over the past 8 years which has benefited Non-Profits such as but not limited to, Tigard Playschool, Family Promise of Tualatin Valley, Love INC, Doernbecher Children’s Hospital Foundation, Gung Ho Ministries, Washington County Project Homeless Connect, Struble Foundation, Music for the Heart, and the American Cancer Society. They always offer special discounts for Non-Profits on all services they provide. Megan – Board Member Tigard Chamber (5 yrs), Ambassador Committee (5 yrs), Marketing Committee Chair (3 yrs), Candidate Endorsement Committee, Relay for Life Co-Chair (6 yrs), Relay for Life Marketing Chair (1 yr), Class of 2018 Leadership Tigard graduate, Young Professionals of Tigard (3 yrs), Tigard Play School (2 yrs), Collaborative Business Builders (2 yrs), BNI Oregon (4 yrs), and countless business and Non-Profit startups. Nicholas – Creative talent behind Tigard Chamber Rebrand and Support for Events, Donation of Design and Creative work for Downtown Tigard events (3yrs), time and talent to Love INC of Tigard, Tualatin, and Sherwood (4 yrs), Tigard / Tualatin Relay for Life Luminaria Chair (6 yrs), Tigard Play School (5 yrs), Collaborative Business Builders (1 year), and countless business and Non-Profit startups. As you can see, Nicholas and Megan have made their impact felt on our community. Please join us in congratulating Edge One Media and Megan and Nicholas De Salvo on this well-deserved award. This award will be formally presented with other Tigard volunteer and business awards at Tigard’s 2019 Shining Stars Community Awards Celebration, which will be held on Friday, May 3rd from 5:30pm-9 pm at Embassy Suites – Washington Square, event location host. With a theme of “Travel” this elegant-themed event includes dinner, silent auction, dessert dash, awards, and more. Tickets are only $60/person. So dress your best and come join us to celebrate Tigard! 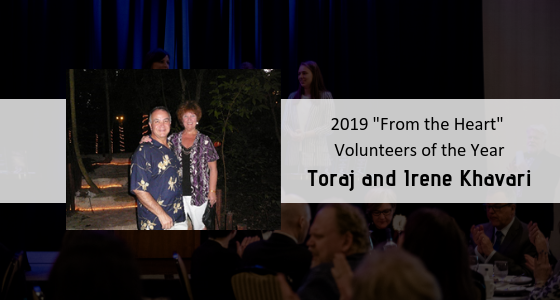 Toraj and Irene Khavari have been selected as the 2019 Tigard Shining Stars “From the Heart” Volunteer of the Year, named in honor of Jim Hartman. Jim Hartman set the standard for this award by his example of giving from the heart to his community, and the “From the Heart” award honors a person who has dedicated their time and energy to a specific cause in the Tigard community. This person gives willingly, energetically and consistently; they might be well known or might be a “quiet” volunteer, unrecognized until now, but always gives “from the heart”! This person may have worked on the same project for many years. You know that wooded area behind your house that looks like a scary jungle of prickly blackberry bushes, overgrown weeds and mosquitos? But when you get up close you start to notice the canopy of oak trees offering shade to blooming Trilliums, unruly ferns and wild mushrooms. As you stand there, you start to hear Song Sparrows chirping warnings of your presence to each other and the flutter of underbrush lending cover to a critter…then a vision starts to form. That’s sort of what happened for Toraj & Irene Khavari and their neighbors living adjacent to undeveloped property on Bull Mountain. Armed with relentless energy, enthusiasm and optimism for what “could be”, Toraj & Irene brought a community together and turned a wild, wooded lot into a neighborhood jewel accessible to all Tigard residents. It wasn’t easy. They worked tirelessly to fundraise and recruit hundreds of volunteers to help with tasks like ivy pulling, path clearing, planting, planning and more. It took monumental commitment, more than 2,000 hours of sweat equity, ingenious ideas to raise money, many visits to the Tigard City Council meetings and a monthly vigil at the city’s Parks and Recreation Advisory Board meetings to lobby for funds from Tigard’s Parks and Open Spaces Bond Measure to purchase the property. In 2018, the Friends of Bull Mountain Park earned the Oregon Parks and Recreation Association’s highest honor with the Oregon Parks & Recreation Volunteer Service Award. The city, Metro and the State of Oregon celebrated Toraj and Irene’s herculean efforts and vision for the park. Representatives from the group accepted the award and I’m sure they knew it was about much more than recognition. It was about lifelong friendships formed while cutting trails, sowing native plants, building benches and a natural playground from re-purposed trees. It was about love for nature, community and for future generations who would enjoy the park and the picnic shelter – including a paved loop that provides inclusive access for trails and users with mobility challenges. Toraj achieved another monumental task – he learned what those government acronyms mean! He forged partnerships with neighbors, community groups, Metro, the city, the state, park designers, business owners, naturalists, grant writers and I bet that he even has the Tigard Library Reference Desk on speed dial! But those efforts paid off. Now Toraj, Irene and city residents have a stunning place to gather on warm summer evenings for picnics and music, a quiet place to hike and enjoy nature and a place for giggling children to leap on logs and wait for a passing critter to come into view. What was once an overgrown labyrinth of trees, blackberries and shrubs is now a neighborhood park. This is truly a great example of what a community can do when it comes together! To learn more about how Toraj, Irene and the Friends of Bull Mountain turned their vision into a reality watch A Park is Born (https://vimeo.com/294689595 ). Please join us in congratulating Toraj and Irene and thanking them for their service to our Tigard community. Their award will be formally presented with other Tigard volunteer and business awards at Tigard’s 2019 Shining Stars Community Awards Celebration. The event will be held on Friday, May 3rd from 5:30-9 p.m. at Embassy Suites – Washington Square, our event location host. With a theme of “Travel”, this elegant themed dinner event includes dinner, silent auction, dessert dash, awards, and more. Tickets are $60/person. Dress your best and join us to celebrate Tigard! For further details about Shining Stars, please contact the Tigard Chamber of Commerce at 503-639-1656 or at events@tigardchamber.org, or go to our webpage at www.tigardchamber.org. 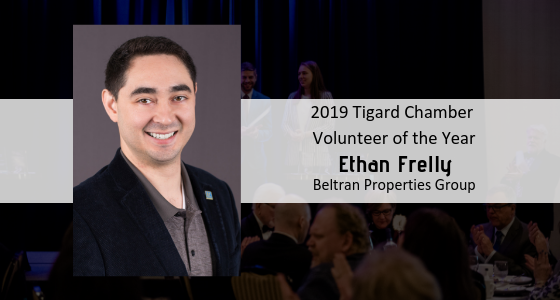 Ethan Frelly, Lead Buyers Agent for Beltran Properties, has been named the 2019 Tigard Shining Stars Chamber Volunteer of the Year. This award honors a Chamber member who has volunteered many hours of time, talent and energy to the success and growth of the Tigard Chamber. Bert Tousey and his example of Chamber volunteerism is commitment at its best. This person is an example of an active member who has sustained their efforts on behalf of the Chamber over a long period of time. By their efforts, they have made this organization more effective in serving the Tigard community. Ethan Frelly has been a Tigard Chamber member for almost 7 years and rapidly engaged with the Tigard Chamber, starting first with our Tigard Farmers Market. With a vision for connecting with younger business people, he advocated for and launched a Tigard Young Professionals program which ran for several years. In conjunction with this, Ethan stepped into an Ambassador role as part of the Ambassador team, serving on this critical committee for almost 7 years, eventually becoming Co-Chair and then Chair of the Ambassador Committee. In his chair positions with Ambassadors, Ethan also became a Tigard Chamber Board member and subsequent to stepping down as Ambassador Chair, has remained on the Board and is currently Chair elect. Beyond these roles, Ethan has made himself available in other volunteer capacities such as our Building Task Force, Candidate Endorsement Committee and GAPP Committee. In addition to these current taskforce and committee roles plus his board role, Ethan has agreed to represent the Tigard Chamber and its business community over the next two years as a member of the SW Corridor Advisory Committee providing business feedback on a proposed light rail line connecting Southwest Portland to Tigard and through Tigard to Tualatin. Another example of his commitment to the Tigard Chamber and the broader community, Ethan self-selected, paid for and participated in the inaugural year of our Leadership Tigard program, a community leadership program designed to help inspire and enable community members to gain a broad understanding of Tigard and create more informed invested leaders who can step in and advocate for our community on a variety of levels. As you can see, Ethan’s volunteerism has been broad and deep within the Tigard Chamber. Additionally, he has been the Emcee for the Downtown Tigard Tree Lighting and has joined the Tigard Downtown Alliance board extending his volunteerism to chamber member organizations/businesses. He is available, willing to help and has great insights and is a tremendous supporter of the Tigard Chamber and its business community. He says his Jesuit college education at Loyola University Chicago really had the biggest effect on his love to give back. 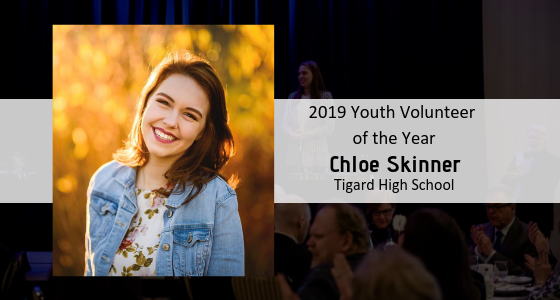 Chloe Skinner has been selected as the 2019 Tigard Youth Volunteer of the Year, named in honor of former Mayor Jim Nicoli, who passed away in 2000. Mayor Nicoli’s dedication to the youth of our community was a fitting way to honor his name and award a youth in our community who volunteers to make a difference. Many young people in Tigard are active in volunteer efforts and it is our pleasure to acknowledge their contributions of dedication, energy and community spirit. They are our future! Chloe is a senior at Tigard High School and plans to become a special education teacher in the future. Chloe has been in the Tigard High School Key Club for four years and is currently the President. She has amassed more than 408 volunteer hours during her high school career. She has volunteered for organizations like Meals on Wheels, Tigard Good Neighbor Center, Oregon Food Bank, Northwest Children’s Outreach and so much more! Chloe is also the Co-President of the Honor Society, Co-President of Sparrow, and President of Super Friends. In working towards her career goal, she is also involved as a peer tutor at Tigard High working with special education students. Please join us in congratulating Chloe on this well-deserved award. Her award will be formally presented with other Tigard volunteer and business awards at Tigard’s 2019 Shining Stars Community Awards Gala held on Friday, May 3rd from 5:30 to 9 p.m. at Embassy Suites – Washington Square, event location host. With a theme of “travel”, this elegant event includes dinner, silent auction, dessert dash, awards and more. Tickets are only $60 per person. So get ready to travel the world and come join us celebrate Tigard! For further details about Shining Stars, please contact the Tigard Chamber of Commerce at 503-639-1656 or at Jessica@tigardchamber.org or go to our website at www.Tigardchamber.org.